← Exidor TB450 electronic latch retraction – now in stock! 1. 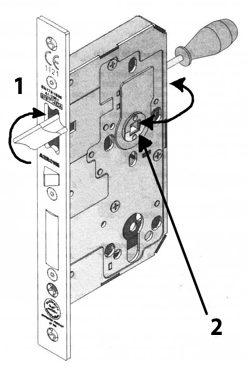 Latch reversibility: To reverse the latch bolt insert a screw driver through the hole in the back edge of the lock case, push the slotted head forward firmly and rotate. 2. Escape reversibility: To reverse the escape function remove the follower plate with a small blade, swap it to the other side of the lock case and insert into the follower. This entry was posted in digital locks, door handles and tagged AR915, escape function, escape sashlock, handing, hoppe, latch bolt. Bookmark the permalink.